If you’re the kind of person who leaves your iPhone in a pocket or purse placed inconveniently across the room, you’ll appreciate the ability to answer an incoming call with your Mac. You can also initiate calls from your Mac—to the other person, the call will look like it's coming from your iPhone, but you'll be chattering away with your Mac's built-in microphone and speakers. For this to work you have to configure both your Mac and iPhone. Configure FaceTime on your iPhone to share your phone’s cellular calls. 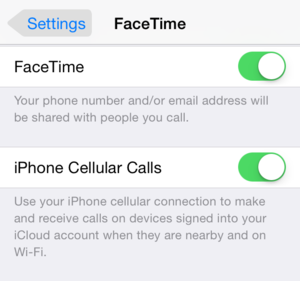 On the iPhone go to Settings > FaceTime and enable the iPhone Cellular Calls option. As the option states, this lets you “make and receive calls on devices signed into your iCloud account when they are nearby and on Wi-Fi.” On your Mac running Yosemite, launch the FaceTime app, open its preferences, and enable the iPhone Cellular Calls option. 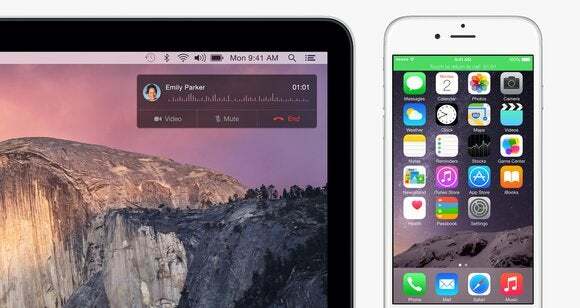 When you receive a call, it will be routed from your iPhone to your Mac. You can still answer on your iPhone if you like, but if you let it ring through to the Mac (which will play its own ringtone), a notification appears where you can choose to accept or reject the call. Answer the call, and you’ll carry on the conversation using the Mac’s microphone and speakers. Making and receiving calls on your Mac can be very convenient. You can also make phone calls from your Mac. To do so, launch FaceTime; select the Audio tab; and enter a name, email address, or phone number of a contact you want to call. As long as they have a phone number attached to their contact, you’ll see a small phone icon next to their name. Click on it and you’ll find those options available to you—Call Using iPhone will be one of them, followed by that contact’s phone numbers. SMS messages will also be relayed from your iPhone to the Messages app on your Mac. When you reply with your Mac, they’ll be converted back to SMS and sent along to their intended recipient.